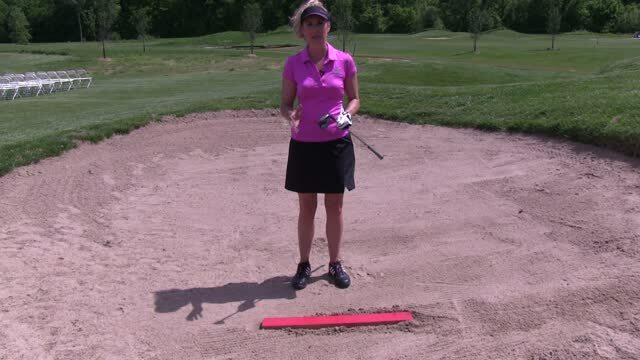 The Foot Depth Drill helps you learn how much to dig your feet into the sand in a bunker. How much you dig your feet in can help determine how much sand you take and how high or low the ball comes out and the type of spin it has. The Two Line Drill helps train yourself to enter the sand at the same point every time to ensure that your swing is bottoming out at the same point each time. This will help you take the proper amount of sand and make the proper splash. The Line Drill for greenside bunkers is designed to help you swing through the ball with a shallow splash as opposed to digging down too much and leaving the ball in the bunker. The Circle Your Foot Drill is going to train you to learn where to enter the sand and how much sand to take in green side bunkers to ensure you are making the correct splash. The 2x4 Bunker Drill helps you get comfortable hitting out of the sand using the back edge of your club (the bounce) and an open club face, rather than digging into the sand with the leading edge. The One Foot Drill for Fairway Bunkers gets you moving through the ball and is a great drill if you are leaning back and/or taking too much sand on your fairway bunker shots. The Fairway Bunkers Tee Drill teaches you how to pick the ball clean from the top of the sand to maximize the distance while eliminating those chunky fairway bunker shots. 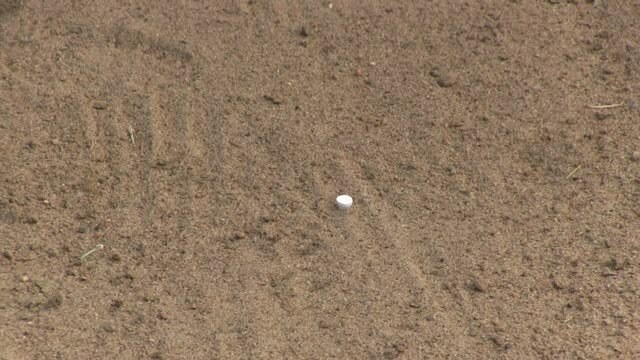 The Cup of Sand Drill will teach you that hitting a bunker shot is no different than hitting a regular pitch or chip and that hitting out of a greenside bunker really can be easy. 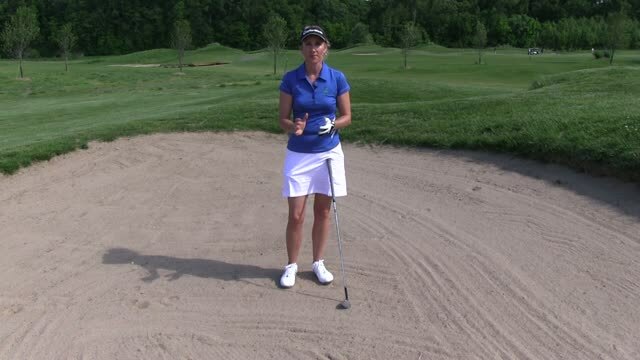 The Greenside Bunker Tee Drill will teach you how to come into a greenside bunker shot on the proper angle to make a nice shallow splash to get you out of the bunker and onto the green. You can practice without a ball in the bunker to make sure you are making the proper splash and taking the proper amount of sand.